It is intuitive to believe that visuals are more memorable than text. To a certain degree, science confirms this. Research shows that visuals impact recall because they help viewers process information faster and assist them to pay attention by being more engaging than text. But there is such a thing as a forgettable visual. Think of all the information you encounter in a typical week. How much of it do you remember? We tend to forget our lives almost as quickly as we live them and visuals can still escape our memories. 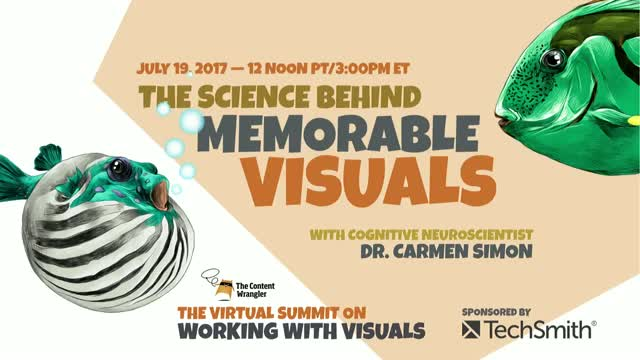 Join me, Scott Abel, The Content Wrangler, for a free, one-hour educational webinar with cognitive neuroscientist, Dr. Carmen Simon, to learn how to stay on people’s minds by applying science-based guidelines from the angle of how the brain processes visuals. You will learn how to use visual thinking skills in four areas that are prevalent in business communication: facts, processes, data, and abstracts. And, you’ll discover how to use design elements such as images, text, lines, shapes to create interesting—and memorable—content. Dr. Simon will provide you with universal visual design principles and explain how they influence viewer attention and retention. In just one hour, you will learn how to create and select visuals that impact memory and how to avoid those that don't. Visual thinking is important because when you use images correctly, you have the luxury of staying on your audience’s minds long-term. This helps you influence their decisions because people act in your favor based on what they remember, not on what they forget. Carmen Simon is a cognitive neuroscientist, bestselling author, and leading expert on using memory to influence decision-making. Her most recent book, Impossible to Ignore: Create Memorable Content to Influence Decisions, has won the acclaim of publications such as Inc.com, Forbes, and Fast Company, and has been selected as one of the top international books on persuasion.